Megasparkle Goomba is a giant Goomba appearing as the boss of World 1 in Paper Mario: Sticker Star. It is a massive Goomba that was formed by fifteen ordinary Goombas and a yellow-eyed Goomba that was corrupted by the Royal Sticker. The Goombas reside at Goomba Fortress and guard the red Royal Sticker. The corrupted Goomba bears a passing resemblance to the Goomba King, albeit without the mustache. The sixteen Goombas that form it were once normal Goombas that resided at Goomba's Fortress. When Bowser accidentally breaks the Sticker Comet and scatters the six Royal Stickers across the Mushroom Kingdom, the red Royal Sticker falls down to the top of Goomba's Fortress. One curious Goomba grabbed it and became corrupted, sticking the Royal Sticker to his head and wearing it as a crown. The corrupted Goomba soon became the self-proclaimed boss of the Goombas and became obsessed with shiny and sparkly objects, such as glitter. The Goomba ordered his Goombas to cause trouble in the grasslands and Decalburg as the Goombas now had power from Bowser. When Mario and Kersti made it to the top of Goomba's Fortress, the corrupted Goomba greeted Mario and threatened to turn him into confetti. Kersti recognized the crown as a Royal Sticker and ordered him to give it back. 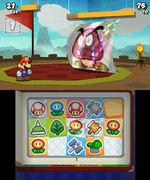 The Goomba then reveals that Bowser gives him the order to guard the Royal Sticker and, with the Royal Sticker, he will become more powerful. The Goomba immediately ordered to other Goombas to attack Mario. At first, the Goombas attacked only by headbonking Mario, like regular Goombas, but soon the corrupted Goomba ordered the other Goombas to merge with him to become its more powerful form: the Megasparkle Goomba. When the battle is reaching its end (the boss reaches 1 HP of health), the other Goombas decided that, since the corrupted Goomba had his body and mind changed by the Royal Sticker, that power was too much difficult to handle so they left the corrupted Goomba because they prefer to be regular Goombas again. The corrupted Goomba became infuriated when they leave and tried to fiercely fight Mario of his own, but was about collapsing and so was easily defeated. The Goomba noticed how the power of the Royal Sticker felt like a "dazzling dream" and that he was powerless without it, then disappears, leaving Mario and Kersti the red Royal Sticker. In the ending parade, Megasparkle Goomba is shown as part of a float along with all the other bosses corrupted by the Royal Stickers. Megasparkle Goomba repeatedly switches between its Megasparkle Goomba form and the sixteen Goombas it consists of. The other Goombas have more HP than in previous games. The Megasparkle Goomba possess a wide variety of powerful attacks. It can leap high into the air and come crashing down on Mario. Also, it can curl up into a tube, similar to the Tube curse in Paper Mario: The Thousand-Year Door. Like any ordinary Goomba in Sticker Star, Megasparkle Goomba can fold up into a paper plane standing upright. This makes him unable to be stomped on with normal Jump or Hopslipper stickers. Finally, he can turn around to reveal the ordinary Goombas. Megasparkle Goomba can then send these Goombas, up to three at a time, flying into Mario. All of the Goombas can also jump up separately and crash down as a whole. Using an effective sticker when Megasparkle Goomba is coming apart will cause damage and weaken him, making him take double damage. The key for beating it is waiting when the 16 Goombas Stickers appear and start to flip: at this moment, Mario should either use the Fan sticker or the Scissors sticker to make all the stickers but the corrupted one to collapse. After doing so, it will be like battling an ordinary Goomba. The Cat-o-Luck can deal lots of damage to the 16 Goombas at the beginning of the battle. Bosu Kuribō Boss Goomba; same as the New Super Mario Bros. boss Mega Goomba. The uncombined form of Megasparkle Goomba looked slightly different in early screenshots, and his name was directly translated as Boss Goomba. This boss, alongside Mizzter Blizzard, are the only two bosses in the game to speak using full sentences rather than just a simple line, like Tower Power Pokey, Gooper Blooper, and Petey Piranha. Megasparkle Goomba is mentioned in the trophy information for Big Goomba in Super Smash Bros. for Wii U. The Papercraft Megacrinkle Goomba boss in Mario & Luigi: Paper Jam bears resemblance to the Megasparkle Goomba. This page was last edited on August 7, 2018, at 20:38.